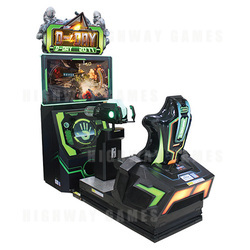 D-Day 2077 combines elements of a sit-down arcade turret shooter, a motion simulator and a Virtual Reality game in this sci-fi doomsday game. In this single player experience, players must battle against hordes of alien creatures and win giant boss battles in order to save humanity. The seat moves according to the action while the player views the scenes by donning an HTC Vive VR headset. A standard flat screen display sits in front of the seat so that bystanders can witness the action. At the player’s command is a large mounted chaingun controller. This sci-fi detailed gun features LED lighting, two handles with triggers and a striking rotating multi-barrel that is back-lit with LEDs. The multi-barrel is covered by a transparent plastic tube for safety, preventing bystanders from inserting their hand and getting hurt.